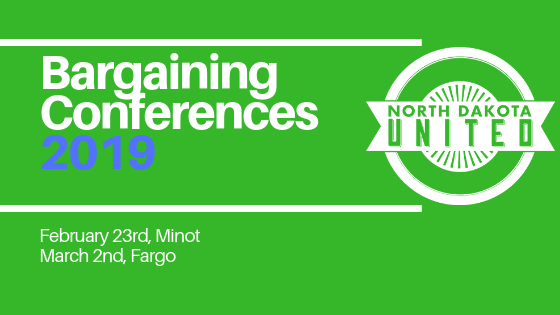 North Dakota United will present two Bargaining Conferences to help locals plan and conduct successful negotiations this year. The first Conference will be held in Minot on February 22-23, 2019, at the Grand Hotel, 1505 N Broadway. The second Conference will be at the Fargo Holiday Inn, 3803 13th Ave S, on March 1-2, 2019. Topics will include Organizing for Bargaining, School Finance, Contract Language, Bargaining for the Common Good, and Talking to the Board. The Conferences will begin with a Social gathering on Friday evening and continue all day on Saturday. Teams may attend either Conference. There is no registration fee, and breakfast and lunch will be provided on Saturday. North Dakota United will also provide financial assistance to locals sending teams to the Conferences. NDU will reimburse locals for one-half of the double room rate at the conference hotel , including taxes for each member requiring an hotel room when necessary and for the cost of one car per local at the standard IRS business rate of $.545. NDU’s assistance is intended to assist locals in sending participants. Locals are encouraged to reimburse expenses not covered by NDU. NDU will not be responsible for making hotel reservations for local participants and that no direct bill arrangements have been made for conference participants.